Oh my, first post of the new year, and April is nearly over! No aplogies, aside from a little teaching/coaching, I've been taking it easy on the performing arts front. And since the beginning of April, I have been in Italy! I will get around to singularizing the domain name, but for now I want to add some new content from the wayward artist abroad. This is my first video that involved any degree of editing. There was a bit of learning curve, it took some getting up to speed but I'm hoping to be able to turn out video more swiftly. I would say that I think video is the future, except that it is the present and has been for most people for a long time. One hesitates to say that theatre is dead, since people have been saying that since the earliest days of cinema, and yet theatre persists. What is different now, however, is that the cost of entry to video has dropped to essentially nothing. I've been staying in Novara, a lovely town with this rather cool basilica that was built on the highest land in the town to be seen from miles around. The only problem is that other buildings crowd round it, obscuring it. In the 19th century a very tall cupula was added, a veritable arm waving, indicating "Here I am!" The Wayward About page attempts to outline Wayward values, starting with, "It is a perpetual work in progress, beams exposed. It subscribes to no ism." Wayward Artists should be singular these days, mostly just me, Deimon Slagg. Back when I was setting down what it should be about, it didn't occur to me to include anything about equal opportunity for all, or the importance of freedom of speech, perhaps because I'm a child of the sixties and these principles are part of my bones from my mother's milk. It seems to me that those battles were fought and won back when I was a tot barely aware of the seismic social changes going on around me, so we don't need to say any more about them. Done deal. I was very grateful to Jarvis for the opportunity to act in his film, John, 316. I set out to attend to this immediately. I open up the attached form. It took me a couple of moments to figure out the second clause. It seemed related to the progressive privilege stack of social justice ideology, so much so, I just assumed inclusion of gay men, but on further examination, it appears they have been dropped from the stack. I am not a white male. 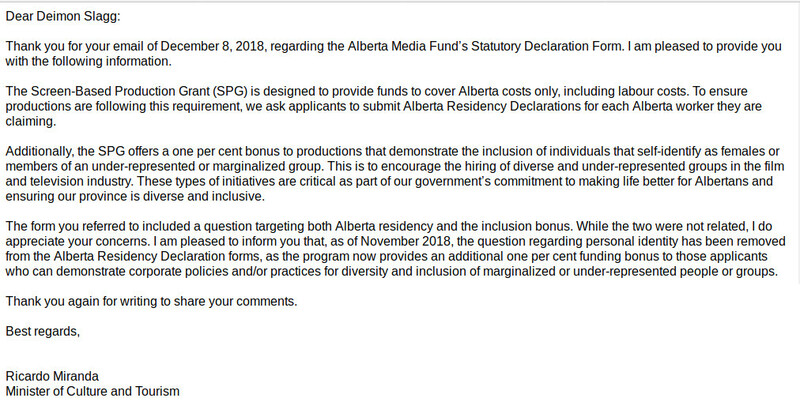 So basically, a production in Alberta can get support from the Alberta Media Fund provided the only white men it employs are from the province of Alberta. The production can employ anyone else in the world, so long as they are not white men. It also raises issues of privacy, because they are asking for information they don't need to know and have no business asking for. Why do they need to know your intersectional status, unless it is to discriminate, that is to say, to make distinctions based on race, gender, or other intersectionally recognised group determiners. Though in this case, the distinction is pretty damn specific: white men and everyone else. Principles apply to everyone. When you try to fudge a principle by saying it applies to these people but not to those, the principle is reduced to a prejudice. Jarvis was sympathetic, but I got the feeling he was disappointed that I hadn't checked the residency field, so I came up with another option: remove all the discriminatory material from the form thus turning it into an inoffensive residency confirmation form. In the meantime, I get the following from Shaun who I believe is handling the paper work. As if I would want to work on productions which discriminate against people based on race, gender, sexual orientation, or any other stupid reason for discriminating against a person. I hadn't read the end of Shaun's previous message as a threat, but now I'm hearing a Monty Python mob voice in my head saying "nice little career you got going here, guv, shame if anything bad was to happen to it." Deimon, it's either "hard drive dies" or "hard drives die", you can't have that many 's's. Clearly Shaun has me rattled. What threat indeed! Silly me. I certainly accept what Shaun wrote at face value, and have thanked them for the clarification (I'm using plural pronoun to avoid misgendering). But it is interesting that in spite of having my best interests at heart, as well as the best interests of producers, that I could feel as though my livelihood was being threatened. And I should have clarified myself that I don't regard Jarvis as a racist or a sexist, of course not. He's made a movie, it cost money, he needs to recoup the cost, so he is compelled to bend the knee to the ideology. As Shaun says, "As producers if we take their money we have to follow their rules whether we agree with them or not." Shaun and Jarvis aren't the baddies -- never castigate someone for telling the truth. Shaun isn't threatening me, they're just telling it like it is: bend the knee to the ideology, or your prospects for employment will be jeopardized. I feel a cold wind blow over me from the past. 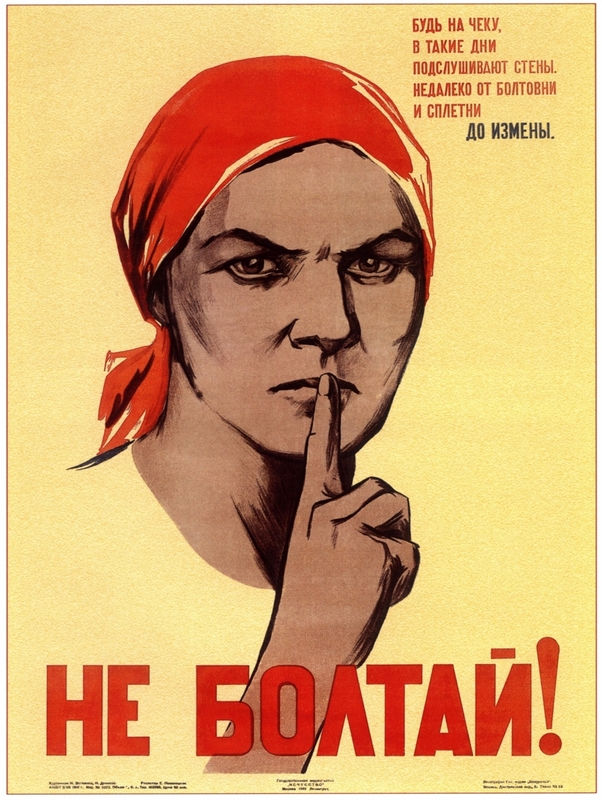 Can you think of an authoritarian regime from history which demanded people publicly declare for an ideology (even if they didn't believe in it), or else they couldn't work (or worse)? Maybe you can think of more than one such regime. Maybe you recall a time and place where people were black listed because authority didn't like how they thought or expressed themselves. Emails above are quoted verbatim with only contact info redacted. I know you can google, but I would prefer Jarvis and Shaun be left alone; as I said, they're not the villains of the piece. 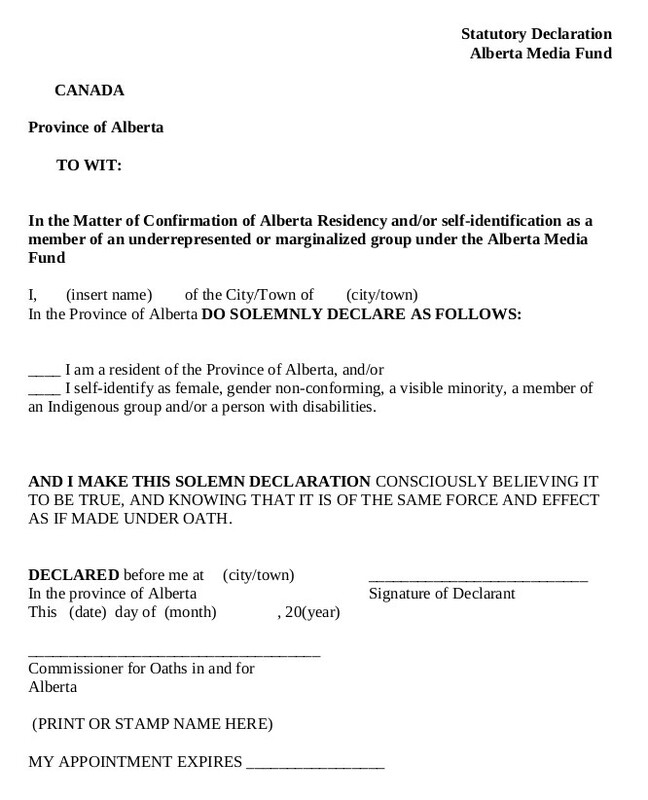 If you want to do something in relation to this, and you live in Alberta, write to your MLA (Find your MLA), as well as to Minister of Culture and Tourism Ricardo Mirando, and to Culture and Tourism Critic Ron Orr. I suggest we encourage our politicians to hit the ideologues where they want to hit us, in the wallet. Any arts organization which serves primarily as a means of promoting an ideology should not receive government funding. All of our arts organizations should be apolitical and serve the people without prejudice or discrimination. For those outside Alberta (and more broadly), please consider carefully before voting for any left or centre-left party which has not disavowed social justice ideology. Our society moved forward by huge leaps as a result of the principles at the foundation of the civil rights and women's liberation movements, principles of equality of opportunity and freedom of expression. We should oppose anyone who would turn these principles to prejudices. We should resist being dragged backwards to a darker time when it was ok to treat individuals differently because of their race or gender. 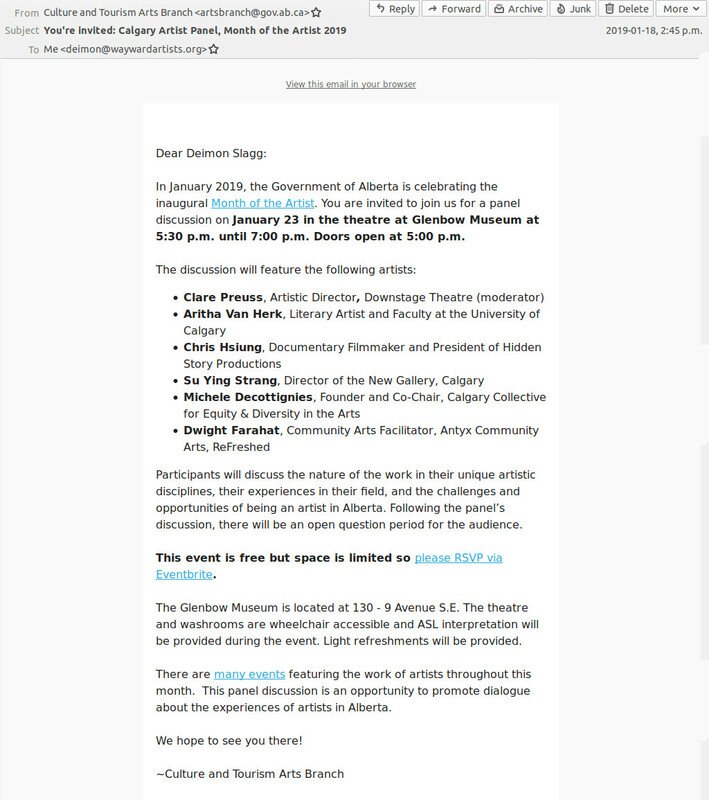 I fired off a summary of this article (with link to it) to the Minister of Culture and Tourism, his counterpart in the opposition, and to the MLA who nominally represents me. I got a response from Alberta Minister of Culture and Tourism Ricardo Mirando on January 3rd saying that they are going to change the form. No response so far from the opposition critic or my MLA. And done and done, I thought. But I hadn't anticipated that the good people at Alberta Culture and Tourism would be so thoughtful as to put me on their mailing list. They're certainly true to their ideology, aren't they: not a single white guy on the panel (even though they represent over a third of the population), but they made sure to have a papered social justice ideologue included! People who use a term like 'inclusivity' as a euphemism for 'everyone except white guys', or who use 'diversity' to mean 'race quotas' shouldn't be allowed in positions of power or influence. They shouldn't be elected to government. Or re-elected. Even if you're an old school lefty like me who believes in actual diversity of thought and culture, and in freedom of expression, of facts over feelings, of principle not prejudice, you might want to consider resisting this new left even to the extent of voting conservative. I honestly believe that they are less dangerous than this new left, since they believe in dialogue (you can't have that fully without freedom of speech), and they know where the line that you do not cross is: Extremism, even on one's own side, shouldn't be allowed anywhere near actual power.